Beautifully engraved certificate from the American Commonwealths Power Corporation dated 1930. The certificate has a ornate red border with a nicely engraved vignette of an allegorical woman in the center next to a power generator and an oil refinery. 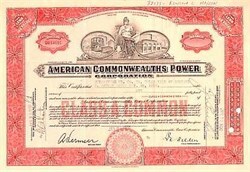 AMERICAN COMMONWEALTHS POWER CORP. (DE) Assets and securities sold to Commonwealths Distribution, Inc. in 1934 No stockholders' equity.